To make this hearty and tasty soup is not too long, perfect for chilling days. 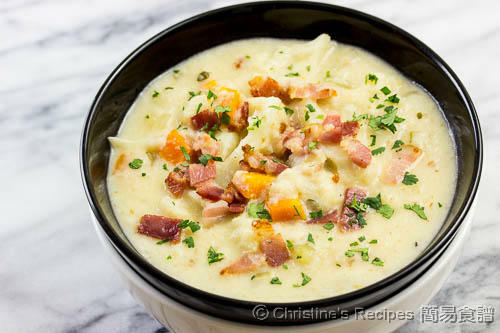 This cauliflower chowder tastes so good. Tastewise, the chicken stock as the soup base is the most important part. It adds a depth of flavours. In terms of nutrition, cauliflower contains lots of nutrients our body needs including vitamins, minerals and antioxidants. It’s low in calories and helps prevent cancer. 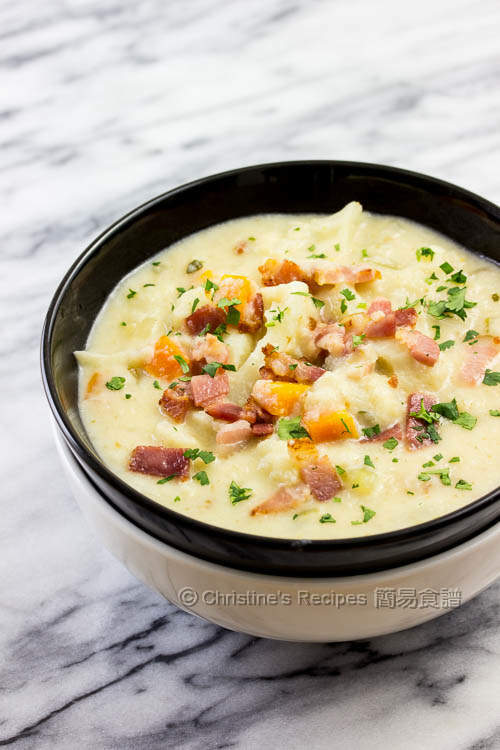 This hearty and tasty soup is quite popular in Australia and US. So I made it to see how my family liked it. Not surprisingly, it got thumbs up. Best still, to make this soup is so simple and easy. You don’t need to boil it too long. It’s a quick comfort soup that is perfect for these chilling days. Soak the cauliflower in salted water for 20 minutes. Drain well. Trim away the hard stem and cut into smaller pieces. Dice carrot, celery and bacon. Set aside. Heat oil in a heavy based pot over medium-high heat. Cook the bacon until oil is released. Transfer the bacon onto kitchen papers to absorb excess oil. Don’t discard the oil in the pot. Reduce heat to medium. Saute the garlic, onion, celery and carrot. Stir in the flour and cook until it’s lightly browned. Add the cauliflower. Pour in the stock. Add the bay leaves, thyme. Increase heat to high. Bring it to boil. Reduce the heat and simmer for 15 minutes. Drain half of the cauliflower out. Let it cool a bit. Put it into a food processor and blend it into a puree. Put back into the pot. When it boils again, add the cream and milk. Season with cayenne pepper, salt and pepper to taste. Add the bacon. Serve hot with crusty bread or salad if desired. 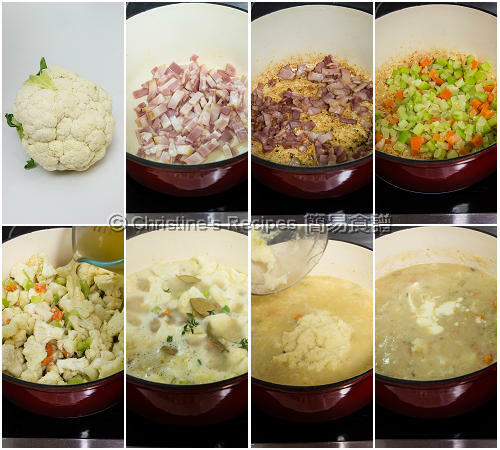 By draining half of the cooked cauliflower and process into puree, it helps increase creaminess in the soup texture. Yet if a food processor doesn’t come in handy, you can skip this step. Choose cauliflower with firm and tightly packed heads, without any dirt or dark spots. Bay leaves, thyme and cayenne pepper are available at supermarkets and Asian grocers. Can't find cauliflower in spring time over here...:-(( Cauliflower is my favourite veggie. This chowder looks really tasty! Ingredients list shallots, directions use garlic. Which is it? Sorry for the typo. It should be garlic.